I stumbled upon this book quite by accident. I found it while searching ebay for vintage magic props. What is it? 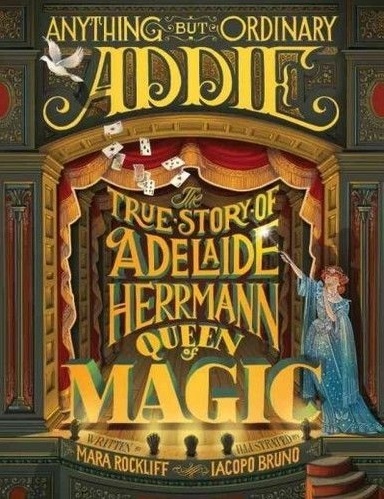 It's a new children's book all about the life of Adelaide Herrmann by Mara Rockliff. I have most great things to say about the book. First, it's wonderful to see a book about a different magician (other than Houdini) for the general public and especially kids. Second, it's wonderful to read about a female magician who deserves all the press she can get, both in her time and in ours! Third, the illustrations are phenomenal. But sadly, there is one negative. It's not something that hindered my reading or my purchase of the book, but I'm a magic fan. They've included the story of the Bullet Catch routine. And though it's historically accurate, schools, libraries and parents are hyper politically correct these days and this one single thing could prevent them from purchasing or reading the book, which is unfortunate I must say. Because I love the book. 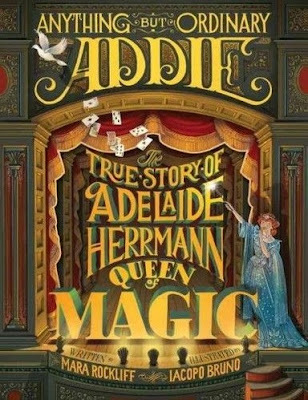 The author did a fantastic job covering the life of Adelaide Herrmann. You also get a glimpse of ole Alexander in there as well. And there is a tip of the hat to the two leading Herrmann historians of today, James Hamilton and Margaret Steele. This book came out in 2016, so James would have seen it and I'm sure he loved it. For those unaware, James passed away this week from liver cancer. If you want to pick up this book, I found my copy on eBay, and I know there are other copies available there as well. The price runs just under $20.